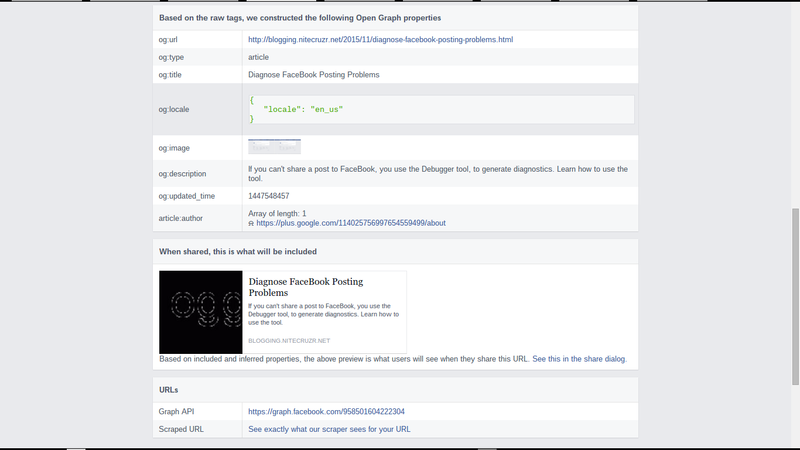 The FaceBook Developers Debugger tool can be invaluable, in diagnosing a problem with our blogs, and FaceBook Open Graph code. 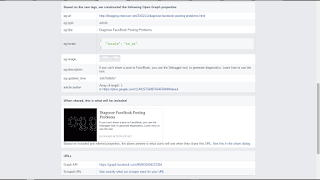 Diagnose FaceBook problems, before asking for assistance. When we try to share a blog post with FaceBook, and get a mangled mass of pictures and / or text, it's a good idea to diagnose the problem, before requesting help. Sometimes, the Debugger will provide the right clues, and help us identify our problems, immediately. 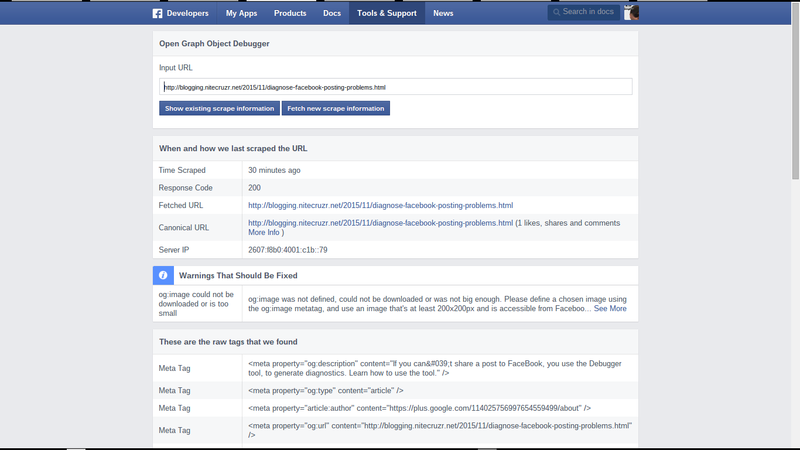 Provide the URL of the blog, and hit "Debug". To use the tool, just provide the URL of the blog, or the post, which has a problem. Paste a URL into the box, and hit "Debug". Use "Show existing scrape information" or "Fetch new scrape information". Start with the immediate errors. 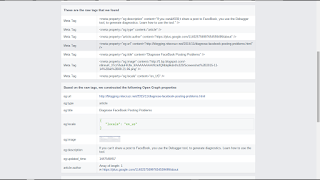 Check the raw Open Graph tags. And the "Open Graph properties", that were the usable part of the code that you provided. The complete code listing is in "Scraped URL". View an image of what your share will look like, when it hits the Wall. And click on "Scraped URL", for the complete code listing. You'll have a choice to "Show existing scrape information" or "Fetch new scrape information" - which can be useful, if you are diagnosing a problem after you shared your blog post. For help on using the tool, you'll see the hint. 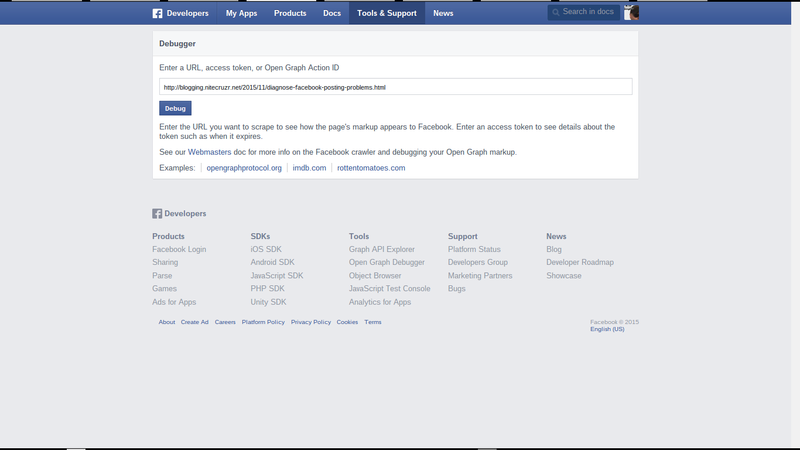 See our Webmasters doc for more info on the Facebook crawler and debugging your Open Graph markup. 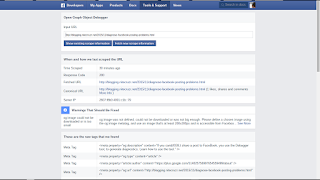 Run the Debugger - then post in the FaceBook Community, if you wish. 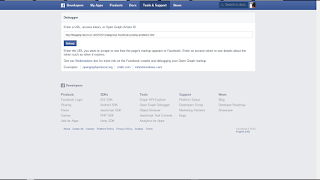 And, if worse comes to worst, and armed with Debugger logs as examples of the problem, we can report the problem to FaceBook Support. Having a copy of the "Scraped URL" page will be useful then. Does this need to be done for every post before publishing to facebook? 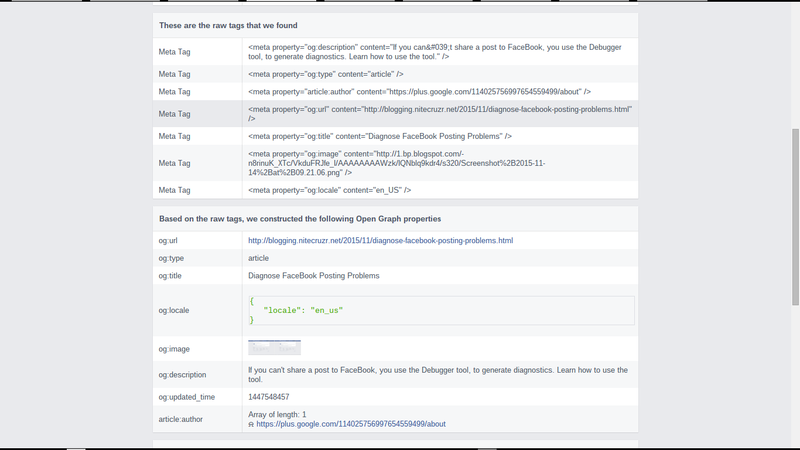 When I use the facebook debugger, and see the list of things to be fixed, do I enter these fixes in the html in facebook? If so, where in the html do they go? An example of how to perform a fix would help. Also, I want my posts to come over from Blogger to facebook without using the name of my blog first in the headline. I want it to show only in the attribution, at the bottom of the post. How to do this? The debugger should show you what is wrong, with the code in the template. With enough determination, you should be able to fix the template code - and thereafter, just worry about post content. In general, no it should not have to be done. Take a look at what gets posted to your Wall - if you are satisfied, nothing more has to be done. If what is posted looks dodgy, then you can use this technique, to figure out what needs to be done. 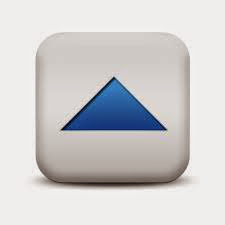 Almost all system code is a balance between what you would like to do, and what can be done, right now. Blogger is a massive conglomerate of compromises.